Killer Characters: Who's Got the Time? Meg keeps trying to tell me I do too much. And I don't know how to say "no." All right, I run my own business, which is kind of in transition from plumbing to building restoration, which around here means mostly colonial houses. I guess that means that it's two different businesses at the moment. It used to be just plumbing when my dad was alive, and I kept that going, but I really like working on old buildings. Right now I've got this great project, repairing a house that's as old as the town of Granford, that some idiot kid ran into with his car. They built houses to last back in 1750, so it can be fixed, but the owner wants authentic materials, which means I have to hunt down the right lumber and paint and such. I'm lucky there's a great old-fashioned sawmill not far away, although it's not getting a lot of business these days. Finding what I need for these projects takes up more of my time. I don't have any regular employees, but I employ a lot of contractors, and that means I have to line up the workers I need for each project and handle the billing and permitting and taxes. Plus I'm a selectman for the town of Granford. The board of selectman is the only government we've got, and there aren't a lot of us on the board, so that means we have to meet pretty often to make decisions about the town—things like drafting annual budgets and do we need a new snowplow this year. Yes, that takes up more time. My mother lives on the property next to mine, in the house I grew up in. Well, actually about ten generations of the Chapin family grew up in it. I like to see Mom when I can—we get together for dinner a couple of times a month. My sister Rachel lives in the next town north of Granford, and it's good to see her now and then as well, but she's got kids and she's running a B&B, so she doesn't have a whole lot of free time. Okay, now that I look at it, I am pretty busy. Which may explain why Meg and I haven't quite figured out where our relationship is going. I mean, who has time for conversation, much less romance, when you're both exhausted at the end of the day? This summer has been particularly hard, because for some reason some of our forests have been hit by a peculiar insect infestation, and suddenly we've got a bunch of scientists and government inspectors running around here and I have to keep up with them. Plus we're in the middle of a pretty serious drought—and all too often drought means fires. We've got a good fire department in Granford, and so far they've kept up, but the danger's going to last for a while. I hope things will be calmer by the time winter comes, and Meg's harvest will be done, and I won't have to worry about big construction projects, so we can spend a little time thinking about us. 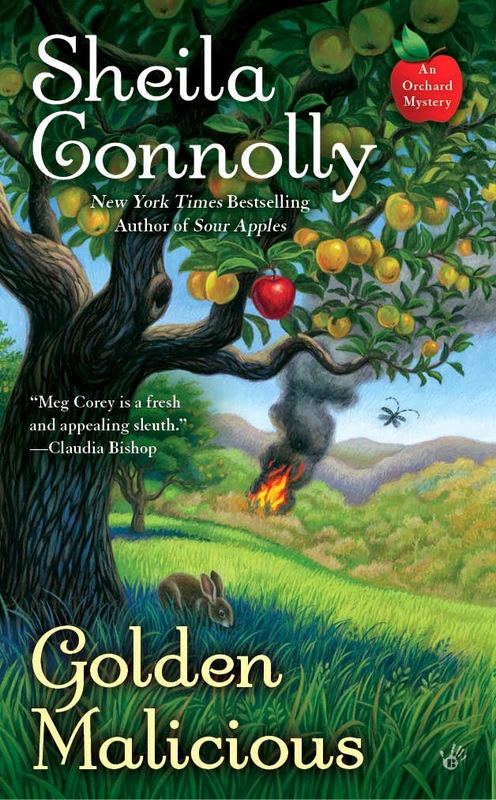 Sheila Connolly writes the Orchard Mystery series, the Museum Mystery series, and the County Cork Mystery series for Berkley Prime Crime. I know what you mean, Seth. I build new homes and restore old ones, and there's never enough time. Sounds like a good plan Seth--taking some time for yourselves! Easier said than done. Good luck! I like you Seth. You are what we call around here, a Jack of all trades. In your case, a Seth of all trades. Seth, when you really want something to keep you busy, come to our house (also here in MA) and help two old grandparents entertain three grandchildren, 2, 6 and 10 and keep them all happy for five hours a day with their varied interests, requests and food choices. and get their homework done before their parents come for them!!!! Now that is work!!!! But we love it just as you love putting up with your work, Meg and all the murders that your town has since Meg moved to Granby. I love to read what is going on in Granby. 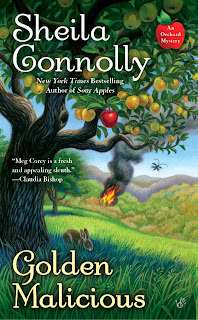 and I am sooooo looking forward to reading Sheila's next book. Just love the series!! !